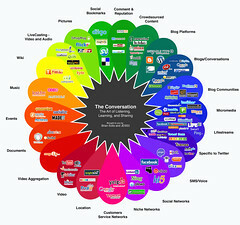 The conversation map is a living, breathing representation of Social Media and will evolve as services and conversation channels emerge, fuse, and dissipate. I'm seeing a remix of the Social Media Game cards. However, the existing "tool cards" have about 3/4 of the tools listed above - but people get so overwhelmed with choices. The holy grail would be a grid that shows prism category, lists the tools, and column that describes possible applications or uses. Whoops .. should have been an open wiki - no registration required. but if you do register, can make you organizer.